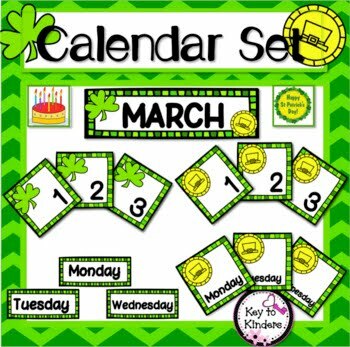 104 Calendar pieces for your March pocket chart. I have included 2 sets of calendar pieces to use in any pattern you'd like to create. On our daily Calendar page, my students draw the corresponding circles along with the date. I give them green and yellow crayons to use and by the end of the month, their calendar looks great! I have also included medallions for holidays and special days. You can tape the medallion to the upper left corner of the calendar piece. When the month is done, store them with the other pieces so that next year you can change the dates when you re-use them. There are extra small shamrocks and coins as well as large ones to make a master pattern.